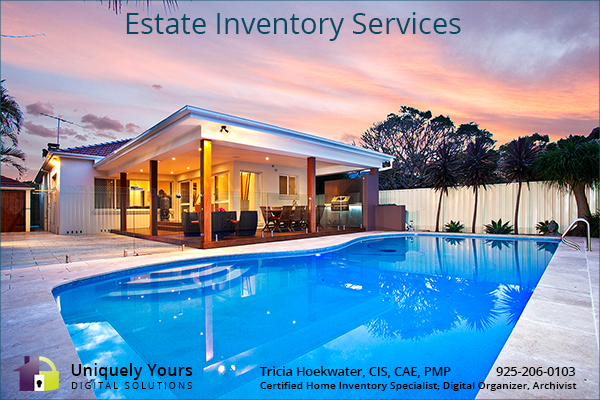 ESTATE INVENTORY SERVICES: An executor is most often a sibling or an adult child. The duties and responsibilities he or she is required to complete are often overwhelming. While experiencing one of the most difficult times of their life, they are burdened with completing the emotional task of creating the estate inventory. The time, stress, and turmoil can be somewhat alleviated by utilizing my Estate Inventory Service. In addition to collecting the information in photos and written report formats, If desired, I also research and assign Fair Market Value to the personal property. These processes were developed under the guidance of estate attorneys, thus ensuring that I am providing the information necessary to file an accurate and thorough estate inventory. Catastrophe can happen in an instant. Protect your estate today with a complete professional inventory! Contact Tricia via phone at 925-206-0103 or by email uniquelyyours@outlook.com to schedule your inventory today.